As we are now in the age of the Internet, many people don’t frequent the public library as we did years ago. In recent years, libraries have become a refuge for many homeless members of our society as not just an indoor place of relief to get away from either the heat or the cold, but also a place for communal gatherings, and a plethora of books to help keep idle minds busy (and of course, the Internet) and is one of the few places besides a shelter where they feel welcome. 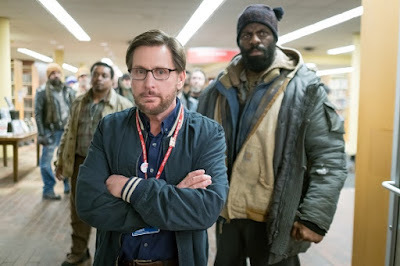 It’s actually surprising that there hasn’t been a movie like The Public made before (it is a tough sell to do), but writer/director (and slowly aging) Emilio Estevez shines a light on how we treat the most vulnerable of society members in this well-cast film about one day the homeless decide they don’t want to leave after closing time. Set in the Cincinnati Public Library, Stuart (Estevez directing himself) is the librarian who goes about his normal duties, operating as middle management at the library: helping people find the books they need, dealing with his uber-liberal co-worker Myra (Jena Malone) who won’t stop talking about her and his carbon footprint every two seconds (the film wears its liberal shirt on its sleeve), and of course, helping the many homeless people who frequent his library. For the most part, it seems like a normal day. However, this is Cincinnati, and it’s during the winter. We only need to remember the polar vortex a few months ago to know that living outside and freezing temperatures don’t mix very well. The library closes at night and the homeless patrons have to leave at closing time and search for an overcrowded shelter if they are lucky. 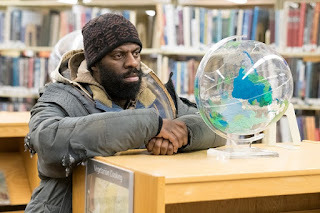 That night, Jackson (Michael K. Williams) talks with some of his friends about the idea of just simply staying in the library “Occupy Wall Street” style to stave off the elements. It seems like a logical thing in a world where the library has vast amounts of space, why not let them declare is an emergency shelter, especially during a cold winter that could literally kill them if they stay outside during it. Stuart, who has his own problems with the city and the library’s bureaucracy in regards to his employment status after kicking one disgruntled homeless person out, finds himself in the middle of it, and he decides to cross the line and help them engage in some civil disobedience. So of course, the local politicians and police are cool with this right? Of course not! Local district attorney Josh (Christian Slater), in the middle of a losing campaign see this as an opportunity to bump up a few points in the polls in the name of “law and order” and enlists expert police negotiator Bill Ramstead (Alec Baldwin) to find a way to shut the protest down. Bill, of course, has his own problems having to deal with his runaway homeless addict son, who why isn’t he more sympathetic? Head librarian Anderson (Jeffrey Wright) while sympathetic to Stuart and the homeless does his best to remain neutral. As the story starts picking up in the news, local reporter Rebecca (Gabrielle Union) sees this as a means to finally get her big break (and Instagram followers), so she sensationalizes the hell out of the story. While a noble effort, The Public is a little too on the nose with its message. While not entirely predictable, the film definitely goes through an Oscar bait checklist as it progresses. Stuarts sudden romantic affair with his building super Angela (Taylor Schilling) doesn’t really add much to the plot and his sympathy towards the homeless (because of his past) is fairly predictable. Even the notion of evoking Occupy Wall Street feels a few years too late. The additional cast includes Jacob Vargas, Richard T. Jones and Che "Rhymefest" Smith (doing a great job as one of the homeless people who displays his own mental illness and insecurities) do an outstanding job with the work they have. While the ending is somewhat predictable (and funny), it’s also very realistic and not overdone for the sake of having some sort of happy ending. The Public is a worthy effort, it has a lot crammed into for the sake of being “woke” that probably should not have all been included in the film. But as long as it gives us a chance to actually stop and think about how we treat the homeless, it’s all good, even if we are force-fed it.